Toss it, float it, chew it, love it! The West Paw Design Hurley is a super tough dog toy that contains all the fun of a ball, bone and stick in one dog toy. Toss it, float it, chew it, your dog is guaranteed to love it! 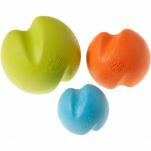 West Paw Design makes it easy to give this durable dog toy a try with a one-time refund or replacement. 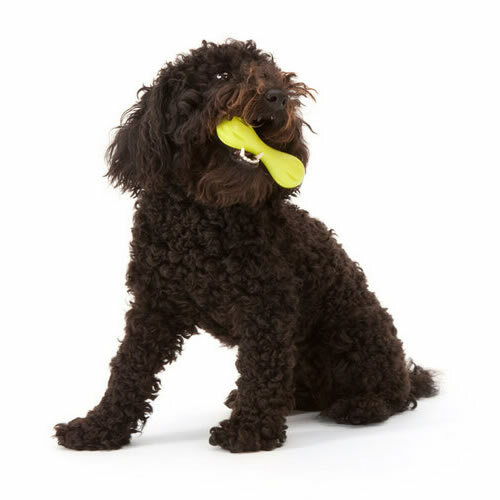 The Hurley is the original dog toy made from West Paw's pliable, one-of-a-kind Zogoflex material, and its success as a durable dog toy launched the full range of Zogoflex toys that West Paw has developed. 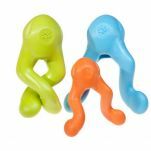 Hurley is 100% recyclable and is a buoyant, made in the USA, non-toxic and dishwasher safe toy. Available in mini, small and large sizes and three bright colours that make them easy to spot in water, snow and grass. My Dobermann is addicted to the Hurley and fetching it from the ocean. I try hiding it from her to give her some socialising time but she relentlessly pesters me until I weaken and start the fetch game. Unfortunately, every other dog on the beach likes it too. My Dobermann is quick but other dog owner’s sheep dogs get it from the ocean before my girl does. Funny to watch dogs swimming for the Hurley and squabbling over it. 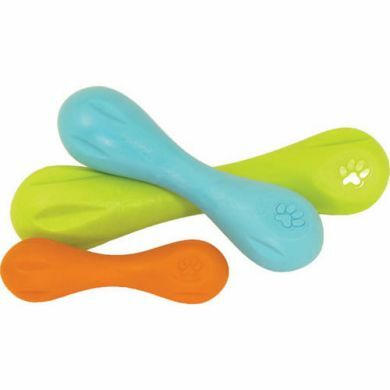 Read 13 customer reviews of West Paw Design Hurley. The average customer rating is 4.8. I think that the shape is good in preventing excessive ingestion of salt water as they swim with it in their mouth. It’s tough, it floats but when thrown into the water from the beachside it takes a short while to surface. My young Dobermann does a bombie into the ocean after it but then gets confused because it is not immediately visible. Also, it floats partly submerged and it makes it difficult to see for a dog swimming with eyes at water level. Perfect size and shape and weight to make it interesting for my whippets. Throw and play, easy and can take a good a hiding particularly with my girl who like to chew and has chewed everything else in past within days, thank you for a tough toy that lasts the distance. Love West Paw Design products for my border collie as he chews and destroys most of his other toys. The Hurley is great, tough and small amounts of peanut butter can be spread into the indents. I ordered a size small but maybe should have ordered the next size up for my size dog. Our 4 year old lab loves her Hurley - so far it has had a daily workout for two weeks and there is not even a tooth mark on it, normally things are destroyed within 30 mins! Great service - I've ordered another in case this one gets lost. A great toy for our chew addict English Bulldog. He loves it and over two weeks in it is still going strong! It is the most robust toy that we have bought. He has managed to shave some of it off but that is after hours of chewing. Highly recommend if you are looking for a strong and lasting toy. My labrador destroys most toys within 5 minutes. The west paw hurley is still in one piece after 1 week..very happy with the quality. Our eight-month old staffie/heeler can (and has!) destroy ANYTHING in a single chewing session, so I was very skeptical whether this toy would last the distance. But it absolutely has - she hasn't been able to bite a single bit off it and being shaped like a bone, loves trotting around with it in her mouth and throwing it up in the air. Great toy! It is small enough to throw down the hall in our house, and my God it is Staffy Proof !!! My Bella loves it, especially when it accidently gets thrown into the pool and it floats, so much easier to get out ! absolutely a great toy. I have 2 staffys & they love it & cant seem to destroy it. for anyone with staffys its just like kong extreme. will buy more from this range.